Empathy and listening is identified by Gary Orren as one of the ethos (characteristics of the messenger) principles of persuasion. Persuasive presenters often share personal stories. The best find ways to ensure that the message is about the audience, not themselves. As Dean Hyers counsels (reference below), the audience will care about the personal experience of the presenter to the extent it can serve as an example to them, a metaphor for their challenge and proof that they can succeed. He counsels presenters not to talk about themselves when it doesn’t help the audience understand their own journey or increase their belief in their own capacity to succeed. Background. 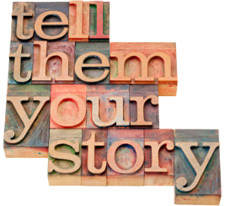 Generally speaking, you can virtually always share your story as background. This can be part of the “proof” that they need. If you’re not a globally famous household name, people will want to know, “Who am I listening to here?” I usually hook with a short powerful story that gets them focused on the topic – like the hook at the beginning of a movie. Opening credits come next, so after the hook I introduce myself, with enough proof of success to justify listening to me. Analogy or metaphorical journey: If my personal story represents their journey, I can use it and it’s still about them. I haven’t shifted my main character if I’m using my own experiences to help them face their own challenges. This works because they might be more able to look at my struggle more easily than they can look at their own. Gradually they’ll recognize themselves within my story. Hint: If you have a personal experience that’s “bigger” than what the audience faces, then your story can carry an entire speech. If not, you can still use your story as a framing device, and you can pepper your experiences throughout your talk. Experiential example or empathy: The other reason to use your personal story is to create an example to bring your point to life. I will often make a point followed by an example to help them understand it. The example might be mine, or a client’s, or one from the audience. But my story is fair game here. Story examples are important because they create an experience of the information. Your personal story is also a way to empathize with your audience for what they’re going through. This can be proof that you really understand them, that you’ve made the same mistakes they have, that you also grapple with fear, and it can demonstrate that you’re taking the same actions you’re recommending. Dean Hyers, SagePresence, When Do I Use My Personal Story in My Presentation or Speech? at http://sagepresence.com/when-do-i-use-my-personal-story-in-my-presentation-or-speech/, accessed 22 January 2016 and Gary Orren, PowerPoint presentation in 2005 to the Mortgage Bankers Association, Persuasion: The Science and Art of Effective Communication, accessed 17 January 2016. Image: John G. Self, Candidate Interviews: The Value of a Personal Story, at http://www.johngself.com/self-perspective/2013/11/candidate-interviews-the-value-of-a-personal-story/, accessed 23 January 2016.